Golf is as challenging as it is fun. Sometimes just the irons or the Fairway Woods will not do the trick. You may need something that can combine both and let you play any shot on any surface. This is why every serious golfer needs their own set of Hybrids. Unable to hit that easy shot because your Fairway Wood cannot hit that ball right, from that rough spot? Lagging behind in your game because your iron could not help you tee off successfully? What you need is a replacement for a couple of your clubs as you cannot carry extra. Replace some of your irons and woods with Hybrids and see the improvement in your game. Since the above list is not informative enough to let you decide, which the best hybrid is for your Golfing needs, here is a detailed review of each of the 5 hybrids. 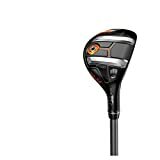 With a brand new design to make your golf club look very stylish and unique, this hybrid from Cobra can turn heads not just with its appearance but with your shots too. With a fixed weight and the CG moved to the back, this club aims to deliver shots as intended, with consistency. Highly rated by other users, this hybrid club can make a great difference to your game. This hybrid is excellently designed and benefits any good player. 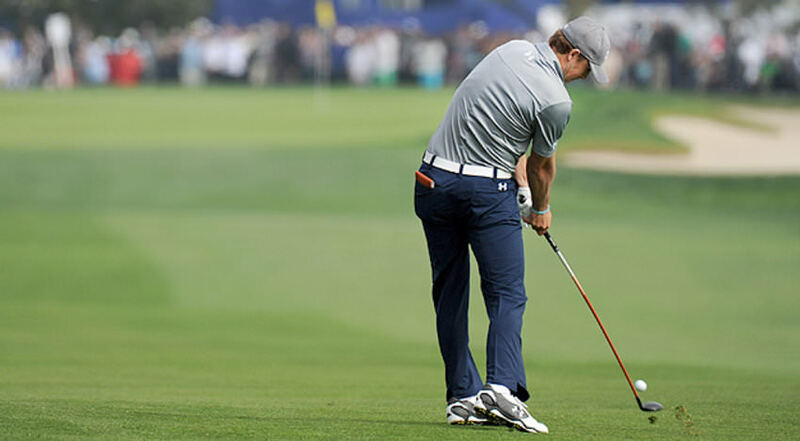 When you have the right swing, you can use this club to play on any turf and not dig in on impact. The weight is well placed to help you hit the ball high and long every single time. With a new design that mimics an Iron than a hybrid, this club not only looks good in your kit but feels good to hit too. This is Mizuno’s first adjustable hybrid that can be easily adjusted as desired using the switch adapter. This hybrid could improve the game for those who are looking for a hybrid that feels close to their irons. Not everyone can get used to playing with shorter clubs as hybrids generally tend to be shorter than irons. For such players, this tall and light hybrid could be a good addition to their kit. Designed to launch higher with better accuracy, this hybrid from Srixon is for the right handed men. With the standard length and lie angle, this club made of graphite is sturdy, light and easy to swing. This hybrid has proved many assumptions wrong. Without any ridge design on the sole, it was assumed to have a bad interaction with the turf but it is equivalent to what other hybrids have. For those who want a club that can be used on various turfs, be it rough or green and hit the ball without digging too much into the ground, this club can be of help. With a larger face to aid more speed and forgive mishits, this hybrid can make any game better. Be it a beginner or an experienced player, when the mistakes are less and the ball travels far with fewer number of shots, the confidence level increases and one tends to enjoy the game better. For those who are looking for a stylish looking hybrid that has high forgiveness and can help improve their game, this could be the one you are looking for. It produces a good and satisfactory sound on impact, something many players look for in a good club. It carries the ball a good distance without losing angle or speed and the large face of the club aids in better trajectory and more distance. Designed to suit the taste of the golfers who like their metallic clubs, this hybrid from Titleist has a gray and black face with a slight progression. The pear-shaped club head makes it look big when compared to other such hybrids in the market. This club is suitable for those who love their irons and want a good finish to their hybrid as well. With high forgiveness and a newly designed face to enable better trajectory and distance, this hybrid can help even beginners play well. As not much pressure or control is needed to swing this hybrid and land some good shots, one need not hit too high or hard. 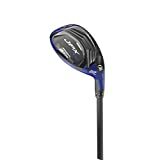 If you have been looking for a hybrid that can go along with your irons (look wise) and also want a club that can forgive mishits and carry the ball far ahead, this could be the one for you. With five different loft options to choose from, this hybrid provides enough variety, so that this club can be used more than the irons or the woods themselves. You cannot take more than 14 clubs in your bag. You have a good mixture of Fairway Woods and Irons in that bag. If you need to take the hybrids with you, you need to replace some of the clubs in the bag. Wondering why you should do that after all? The traditional irons (1-4) are solid and are not very easy to hit consistent shots with. Unless you are experienced or have mastered the irons, hitting well with irons 1 and 2 can be difficult. Also, the hybrids are shorter than these irons, making it easier to hit. These hybrids can be used not only on the greens but also on the fairway or the rough turf or even off the tee. One can even use these hybrids to chip away on the green like professional players. Though it is not a necessity to own a hybrid among your clubs, it just makes the game easier. When you are just a few yards away from the green, an iron may not be good enough as it may not generate the height required. In order to generate the height, one must hit harder and faster, as a result, the club gets scuffed and the grass being snagged. When you have a hybrid, it is shorter, lighter and the CG is placed in such a way that the club allows you to hit swift and the ball is carried far. So, now that you know why you might need a hybrid among your other clubs, which one should you replace with a hybrid? Hough, the manufacturers, mention the number of the iron to be replaced, there is no one standard iron to be replaced. The hybrid requirement will differ from player to player. Hence it is important to try out a few hybrids, before finalizing on the ones for the kit. Choosing the right set of clubs for your golf kit is extremely important. It is what decides your game. Sometimes just the irons will not do and this is where the hybrids come in handy. The products have been reviewed after a careful and thorough research on the products and also getting inputs from players who have used them. Hope this has shed some light on why you need to have hybrids among your irons and how to decide the irons to be replaced.